The deets: J.Crew top and skirt; ALDO heels; Express trench; Rebecca Minkoff mini bag; borrowed umbrella. Rain rain go away, come again another day...preferably not the weekend though, is that cool? Great. Pictures are hard to take in the icky weather so this was all I was able to capture. Bright colors for a very gray day. Nothing too exciting to report on this Tuesday morning, if you are in DC, stay dry folks. I'm out. Your pictures in the rain came out great! I love all the bright colors. Love these bright colors in the winter! PS - cute umbrella too! I love these pretty colors together! Perfectly cheerful for a rainy day. Brights in the winter (or rain!) always cheer me up. Your lipstick is perfect here too! love the combo of the light purple and red, plus your lipstick looks great! 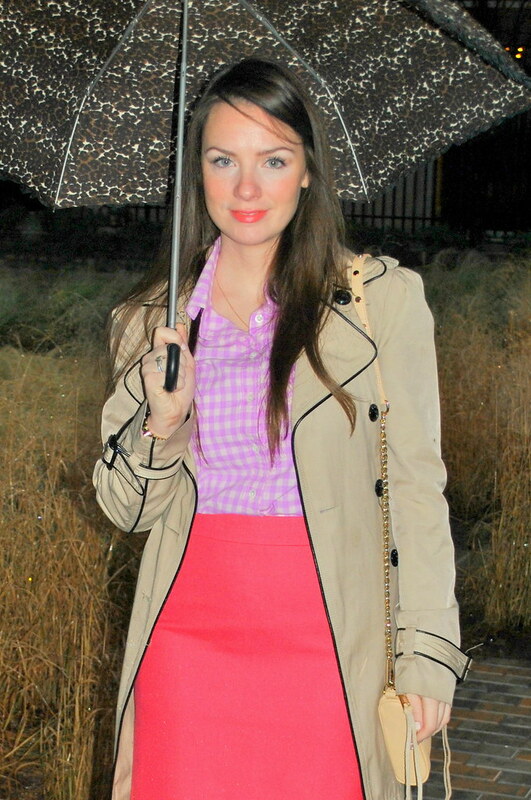 Your lipstick and skirt definitely brighten up the gloomy weather! LOVE the bright on a rainy day! I need to try this. It's been dark and gloomy for almost a week! I love this! The colors look incredible. You are LOVELY! I admire you for wearing colors in the rain. I like to wear black. And mope around. And stay inside. :) I am jealous of your purse...love RM! At least you have a cute umbrella! Also I'm really impressed that you wear your hair down on a rainy day. I totally don't even bother! this is such a pretty look on you :) happy new year! Love this color combo! That skirt is amazing! Love your outfit!! That skirt is fab!! Love the color!! Wish I looked so stylish in the rain!! Love the bright colours, perfect for the dull weather!